Smt R Sornambal, born in 1935 in the town of Kalaiyar Kovil, Sivagangai District, Tamil Nadu, hails from a family of music-lovers. Her father Shri Ramaswamy Ayyar was an amateur vocalist, and her mother Smt ‘Chellammal’ K Meenakshi was also a connoisseur of music. Sornambal and her elder sister Rukmini were both vocalists, and both sisters used to perform together frequently. Eventually, urged to learn music formally, the sisters came under the tutelage of Suchindram Shri S P Sivasubramaniam, who was then teaching in the Tirunelveli area. Shortly thereafter, Sornambal and Sivasubramaniam got married, and Sornambal began her three-decade-long career as a music teacher, teaching higher secondary students and also training teachers at a government school. Sornambal also trained in Harikatha (musical discourses relating stories from Hindu culture) under Sivasubramaniam, as well as under Shri N S Ramaswamy of Nagercoil. Thus, she also became a Harikatha artiste and presented many stories from the sacred scriptures dear to the people of Tamil Nadu. Most of these were beautifully set to song and dialogue by her gifted husband Sivasubramaniam, and people thronged to witness these performances. 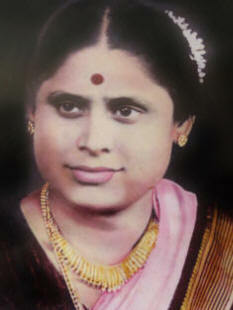 The Harikathas she had performed include Valli Tirumanam, Sita Kalyanam, Tirunavukkarasar Charitram, and many more. 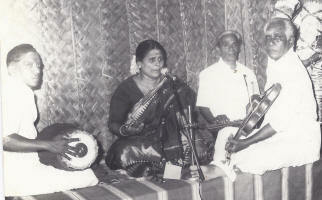 Her Harikatha performances were often accompanied by Sivasubramaniam and their children on violin and mrdangam. Awards and titles such as ‘Katha Gana Ratna’ and ‘Iyal Isai Kalai Chudar’ came her way, but she was most popularly known as ‘Senkottai Thangam’ ('Gold of Senkottai'). By 1993, Sornambal had retired from her school and resided in Chennai with her son Akkarai Shri S Swamynathan and his family. Sornambal attained the lotus feet of the Lord on 3rd March 2019.